Contest Closed Winners Posted Below. Aye you'e wrecked yer galleon n' landed on a haunted island , yer galleon be all busted up by tem Cutthroats. Yer unaye how t' git help, so searchin' through t' wreckage ye find; a small piece o' charcoal, a bit o' paper and one yum yum bottle with a cork. Ye be decidin' t' send a message in a bottle for help. 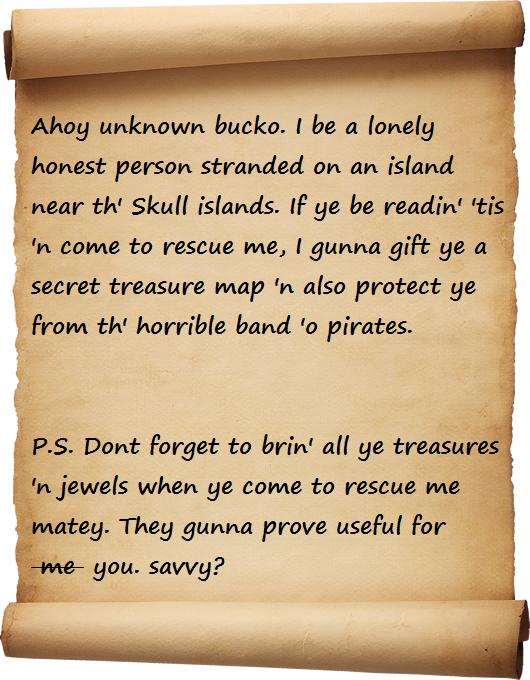 So send me a message in ye best pirate lingo, how to find yer haunted island So ye can b' rescued. 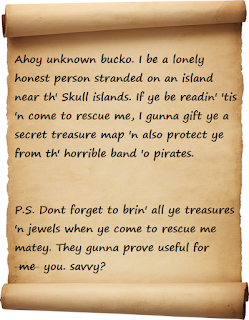 Write a message (In yer best pirate lingo) and send it into a windlane for help. Be creative! 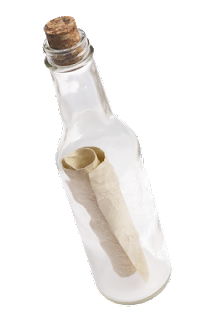 Remember you only have; a small piece o' charcoal, a bit o' paper and one yum yum bottle with a cork. to get your message out for help. How would you ask for help using the items given? Be creative. * This contest begins October 12, 2016 and ends October 23, 2016 at 4:00 pm Central time. * Send your in game name ,such as Perilous Paige and with your entry. Date your entry. * You may use Talk like a Pirate Translator for pirate talk help. * All prize winners codes are sent via their entry email. Please make sure you have the correct email. If you are under the age of 13 please have your parents or guardians permission. 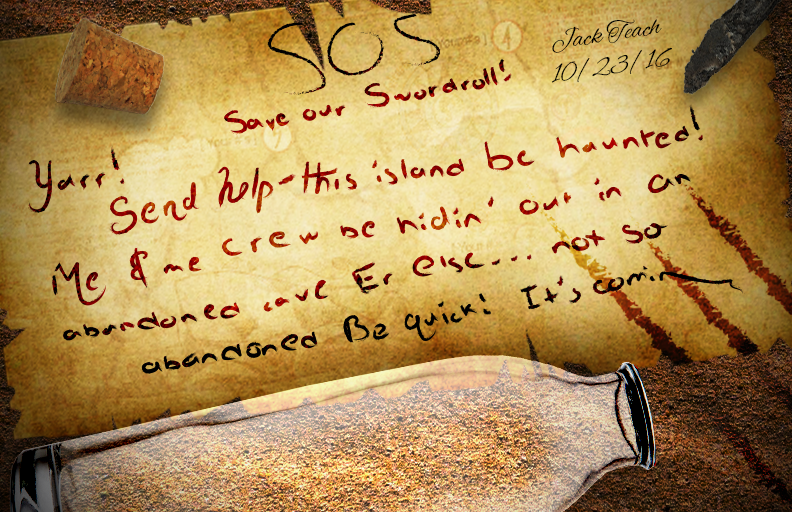 If yer readin' this here message, I being stranded on an island just north of Flotsam. Send help. I've crashed me ship on this strange island 'n needs assistance. I've been here fer three hours 'n already thin's are gettin' out o' hook. Several slimy scyllas crawled out o' a hole whence I've heard several scary wails. On o' th' scylla loot me boot 'n I haven't seen it since. A burnt down village o' undead pirates live.. erm.. I mean reside nearby 'n already 6 o' them 'ave challenged me t' a duel. All o' th' yum trees here are dead, a glowin' monkey throws bones at me, 'n a ghostly rat named Lasko keeps cryin' on me shoulder. Send help ASAP! Belay what e'er ye be a swabin' and head me tail o' woe. The name be Captain Dark Malvin Stevenson and I been sailin' the windlanes o' Darkmoor. A heap o Cutthroats took fancy ter me vessel and blasted her t' bits when I let me guns loose. Tehm bildrats! I be marooned 'pon some blasted spit o' land t' teh east side o' Darkmoor. Bring ye ship 'bout, coax all teh wind ye can in tehm sails and be about it lad 'fore tehm spooks be 'pon me. Codes can be redeemed from any location worldwide, but are only redeemable at https://www.pirate101.com/promo. These codes expire on 01 Feb 2017. 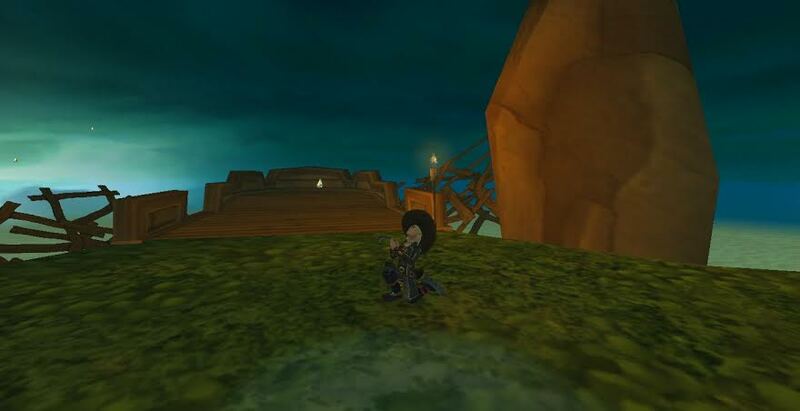 If you encounter an problem redeeming your game code, please send an email to community@pirate101.com and include your code and Pirate101 account name, but never the password!